Adding a dog to your life is a fun but serious commitment. It’s one that should be given much care and consideration. As much as we love our sweet little English Bulldog puppies for sale, we know that we want them to go to the right homes that are ready for them. Are you ready? Read below to give yourself an honest assessment. If you have other questions, feel free to contact us. It’s a commitment, remember this. Yes, our English Bulldog puppies for sale are simply adorable and you want to scoop each and every one of them up and take them home, but you need to be sure. Remember we said that you have to do an honest assessment? Ask yourself if you’re ready for emotional, financial, and time commitments? Make a list of questions and considerations. Are you aware of the personality and physical qualities of English Bulldogs? Have you considered their energy level and matched it to yours or your family members? They are rather sedentary dogs that like chilling more than anything else. Are you familiar with their grooming needs, dietary demands, or ideal weight goals? 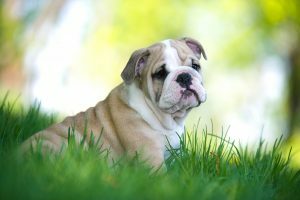 These are things you should consider when deciding on purchasing English Bulldog puppies for sale, or any dog for that matter. It’s important for you to tackle these questions now so that you don’t make a wrong choice that consequently hurts you or the dog in the long run. Invest in a good vet. Ask around and questions before making a decision. Once you’ve found a referral for a vet, don’t feel odd about making an appointment before you purchase one of our English Bulldog puppies for sale. Vets will sit down and speak with you to give you the generic rundown of this breed. You may find that you are definitely ready or need a little more time. In any case, you should choose your pet’s vet as carefully as you’d choose a doctor for yourself or loved ones. How’d you do? Were you honest with yourself and decision? We know you’re on the way to responsible pet ownership since you’re reading this blog! When you’re ready to take the next steps, don’t hesitate to contact us.